Dr. Maria Vallejo is congratulated by Fatima Cajas, a PBSC graduate, past ASPIRA scholarship winner and one of numerous students whose lives she has impacted. She had a desire to go to college, but before that chance meeting with Vallejo 10 years ago, she couldn’t see past the barriers she felt as an immigrant from Ecuador. While frequenting the eatery inside a Lake Worth gas station, Vallejo slipped her a business card and encouraged her to enroll at PBSC. 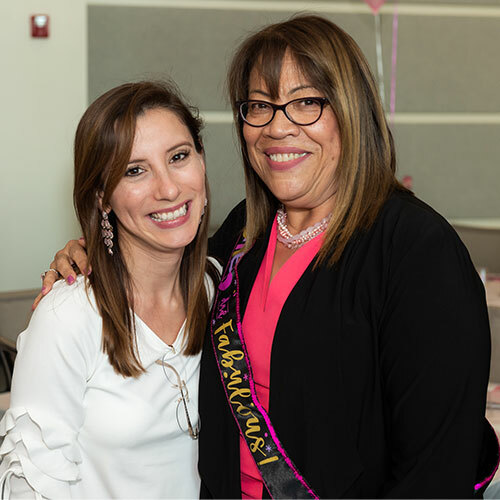 Cajas, who received an Associate in Arts degree from PBSC in 2016 and is now pursuing her bachelor’s degree in communication and journalism at Florida International University, was among attendees at Vallejo’s retirement celebration on the Lake Worth campus March 25. Vallejo, who worked in higher education for 43 years, including 20 at PBSC, was lauded for her outreach efforts to enhance diversity at the College, particularly raising the number of Hispanic students, and drawing the community and businesses to the campuses. She also was praised for mentoring aspiring higher education leaders and supporting students like Cajas and many others who needed help finding their way. Since her arrival at the College in 1999, the population has become increasingly diverse, shifting from 11 to now 31 percent Hispanic students. Dr. Dennis Gallon, former PBSC president who initially hired Vallejo as Lake Worth campus provost and was among the celebration speakers, highlighted her involvement in helping the College earn its designation as a Hispanic Serving Institution, which is reserved for those with enrollments of at least 25 percent Hispanic students. Gallon described Vallejo as a “person with a big heart” who has done much for PBSC. She partnered with the Excelencia in Education organization, which helped the College achieve its goal of becoming an HSI. Part of that required encouraging students to self-identify as Hispanic to give the College an accurate picture of its demographics as well as translating information for parents to help their children. Vallejo launched “Family Fun” days and other initiatives to get the community involved with the campuses and to drive enrollment. Through her involvement with the Puerto Rican Hispanic Chamber of Commerce, which honored her this week for Women’s History Month, she garnered support from local businesses for the College and students. Among her many achievements, Vallejo was the driver of a scholarship launched by ASPIRA of Florida in 2008 that has awarded nearly $47,000. Then in 2016, Vallejo created an ASPIRA scholarship bearing her name that has awarded $11,500 to 13 students. Dr. Vallejo has been a mentor and a friend. I will never forget how she made me feel when as an adjunct professor who taught at night, she would leave small “Thank you” notes recognizing my labor at the college. Later as her direct report she was the kind of boss who completely trusted the professionalism of her team and gave me latitude and autonomy to get the job done. Thank you Dr. V. for all you did to advance the education of so many students and encourage the leadership of those who worked for you. You have done well. You’ll be missed! Congratulation Dr. V, enjoy you retirement. You have been the change what you wanted to see as per your Gandhian Philosophy! Best wishes and Congratulations on an impactful and illustrious career with PBSC! I remember the two special meetings we had – my CC meeting when you kept on praising my hard work, and also the day I barged into your office as I had to rush to Nepal on personal matter, and you gave me such courage that made me even stronger! You have been an admirer of passionate and hardwork, and supporter like a rock to me and many of us here! When I think about what it means to be servant leader, the first person who comes to mind is Dr. Vallejo. Thank you for the lives you’ve touch directly like mine and of those indirectly like new born daughter’s. I wouldn’t be here without your encouragement, support and ultimately, your love. True leadership is one’s ability to make everyone you meet feel special and seeing their potential, many times before they do. Maria, you are a truly extraordinary educator and visionary. Your community outreach efforts have laid a solid foundation upon which we all are now responsible for continuing to build. You’ve made an immeasurable impact on the campuses you’ve served and the many lives you’ve touched. Thank you and may God Bless you as you enter this new phase. I know you’ll continue your amazing service to our community in a new way. Looking forward to working together, again. Maria Vallejo is an amazing friend, mentor, and educator. She was the driving force for my daughter to ascertain her college education. She gave her the strength, encouragement, compassion to achieve her education, even though she was fearful and didn’t believe in herself. Maria always has an open door policy and has helped so many people in the community achieve so much. May you be blessed with health, happiness, and much love in your well deserved retirement. Dr. Vallejo, Muchisimas Gracias por todo! I want to wish you the best on your retirement and many blessings on your family. Thank you, Dr. Vallejo, for everything. You have been a wonderful teacher, mentor, leader, and friend. You are everything one could look for. You groomed us to be sound professionals and made working with you an interesting and memorable experience. I will always be grateful to you for your support, your kindness and for guiding me on the right path. It’s impossible to count all the ways that you’ve helped me in my education, work life and career. Thank you so much for all that you’ve done — I only hope I can return the favor someday. Dr. V, Nuestro Orgullo Hispano! leaders you leave behind. Thank you for changing my life and the life of many. You are a second mother to me Maria. You have always left people and places much better than when you found them. Thank you for sharing your true character with the world. Congratulations Cousin On Your Retirement! We Are Very Proud Of Your amazing Career and accomplishments. Enjoy The Next Chapter Of Your Life and visiting us in California and Hawaii. Thank you for your guidance at PBSC, and for your many years of dedication. Good luck to you. I was truly blessed to have the opportunity to work and learn from such an amazing leader. Thank you for our time together. Nunca es tarde si la dicha es buena! Enjoy your much deserved retirement. Congrats, Mrs. Vellojo! Sounds like you had a fabulous career & inspired so many people …. I’m friends with your son, Leonardo Vellejo-Bryant, who you must be very proud of, as well. He comes from great stock & looks like you, too! Enjoy your retirement & many wonderful & healthy years to come! Dr. Vallejos’ leadership skills and passion for colleges reached across to Dallas, Texas. She was my mentor through the National Community College Hispanic Council this past year. She very willingly shared her expertise and took time from her busy schedule to mentor me. I truly appreciated her time and advice. Wishing you a retirement that fills your spirit with joy!! THE BEST WOMAN/FRIEND I HAVE EVER KNOW! SINCE YOU ARE NOT LEAVING MY LIFE I CAN BE CONTENT CONCERNING YOUR TRANSITION. ROCK ON WONDERFUL LADY!!!!!!!!!!!!!!!!!!!!!!!!! !